Marine debris is a global problem. 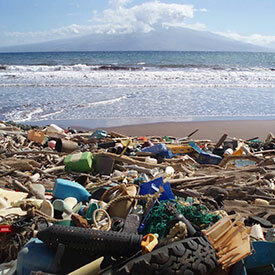 The mission of the NOAA Marine Debris Program is to investigate and prevent adverse impacts from marine debris. Since 2006, the NOAA Marine Debris Program has supported over 100 marine debris removal projects across the country, removing more than 5,500 metric tons of debris from our oceans and coasts. 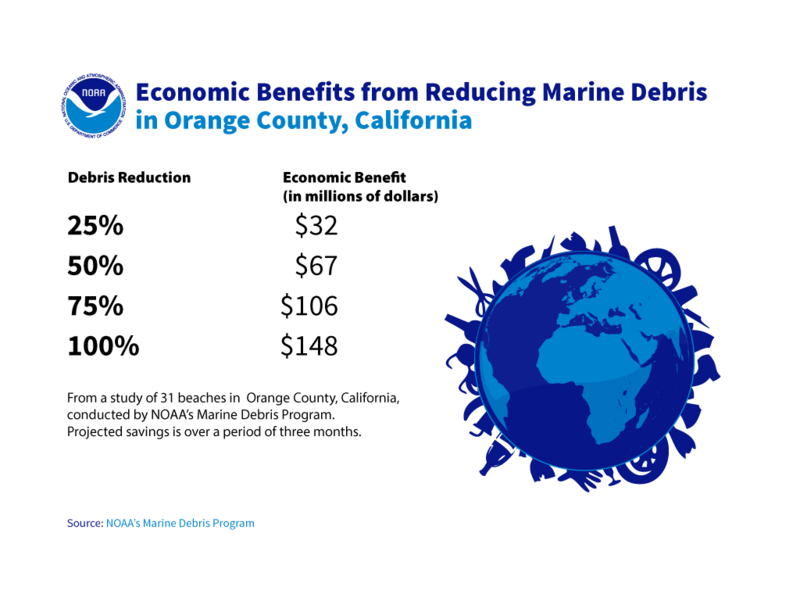 A study in Orange County, California, found that reducing marine debris at beaches by even 25 percent could benefit residents by roughly $32 million from increased summer tourism and recreation. Worldwide, more than 200 species of marine life have been harmed by debris, with impacts that include injury, illness, and death. Marine debris takes many forms, including derelict fishing gear and vessels, abandoned recreational equipment, and discarded consumer plastics, metals, rubber, paper, and textiles. Countless consumer items make their way into the ocean every day, while thousands of abandoned and derelict vessels litter ports, waterways, and estuaries. All across the world, large areas of concentrated marine debris are formed by rotating ocean currents. These areas are known as garbage patches and are mostly made up of microplastics that swirl throughout the ocean’s water column. The ramifications of marine debris are many: economic losses, habitat damage (including to fragile coral reefs), hazards to navigation resulting in costly vessel damage and loss, potential invasive species transport resulting in expensive and devastating effects on ecosystems, and wildlife injury, illness, and death. A team of researchers found that by removing derelict crab pots in certain active fishing areas, harvest of blue crabs could increase by 23.8 percent (38 million pounds), which translated to $33.5 million over the study period. The NOAA Marine Debris Program is involved in the Fishing for Energy partnership, which provides recycling bins to fishermen and converts old gear into energy. More than three million pounds of fishing gear has been collected in 44 communities, and enough energy has been generated to power 2,200 homes for a month. Fishing for Energy also provides grant funding for removing derelict fishing gear and the creation of new technology. Marine debris can impact a large variety of marine life, from small microorganisms to humpback whales. Animals may inadvertently eat debris or become entangled in it. For instance, plastic bags are a common threat to sea turtles, which often mistake them for a common food item—jellyfish. Marine debris affects other species as well, such as the endangered Hawaiian monk seal, where one death caused by marine debris is a huge loss.